If you’re over 55, you should have had a colonoscopy. If you haven’t, call a gastroenterologist, because this could save your life; It did mine, but that’s another story. I had another colonoscopy (about a half dozen, so far) a few days ago, and I must tell you that it’s a very unpleasant experience, mainly from the mental anguish, anticipation and the discomfort of the “preparation” the previous day. I had a lot of time to think about my procedure and I started thinking about how this experience parallels that of buying a car. It’s something you must do and has a very good benefit, but you dread the process. My newspaper columns and blog consist mainly of suggestions and inside information that can make your new or used car buying experience less of a fearful one. Some of the titles/subjects are “Always Get an Out the Door Price”, “Bait and Switch Advertising”, “Beware of Deceptive Internet Car Pricing”, “Beware of Direct Mail Car Advertising”, “Buying a Car When You Have a Credit Problem”, “Eight Steps to Ensure You Are Buying the Best Car for the Best Price”, “List Price and MSRP Might Not Be the Same”, “Negotiating to Buy a Car”, “Open Letter to Florida Car Dealers” (I, II, III, and IV), “Shop Your Financing and Trade”, “Should I Buy My Car at the End of the Lease?”, “Should I Lease or Buy my Next Car?”, “Should I Pay Cash or Finance My Next Car?”, “Should I Trade in My Old Car or Sell it Myself”, “Tell Your Car Dealer to be Nice”, “The Right Used Car is a Better Buy than a New Car”, “Translating Misleading Car Ads”, “What is the True Cost of that New Car?”, “What to do if You Are Treated Badly by a Car Dealer”, “When is a Car Sale Not a Car Sale?”, and “The Internet Price is the Lowest Price for a New Car”. You can read all my articles (hundreds) at www.EarlOnCars.com. You’ll find links there to listen to my live, weekly radio show (Saturdays 8-10 AM EST), my YouTube videos, Podcasts, Facebook, Twitter and a wealth of other information on “how not to get ripped off by a car dealer”. Almost every one of these articles originated from readers of my column, callers to my radio show, and others’ experiences when buying cars from car dealers. I get a lot of calls from people who’ve never bought a car from me. They call to tell me of their bad experience with another dealer and, when I get several calls on the same subject, I write a column on it. People often call me asking for advice or assistance after they’ve already bought, which is “closing the barn door after the horse is gone.” On more than one occasion I’ve called car dealers asking them to consider undoing a wrong they have caused one of their customers. I must confess that my batting average on this effort is “below 300”. I won’t give up, however. One of my most recent calls was from a customer who was charged nearly a $1,000 in service work performed on her car when she had brought it in for a routine service that should have cost her less than $100. She called me for help and was forceful and diligent in following my advice. She got a complete refund on the “unasked for, unnecessary charges”. One thing that amazes me about these weekly columns and my radio show is that I have been writing and airing for nearly 14 years is that no car dealer has ever called me to complain, or for any other reason. I’ve not been sued either. I think that says something about the truth of my articles. I’m not a lawyer, but I do know that you can’t successfully sue somebody for libel or slander if they write or say the truth. I’m puzzled why not one single dealer would call me just out of curiosity. I don’t have a secretary and I don’t screen any of my calls…nor do any of my employees. They do know how successful my dealership is and how fast my sales are growing. They know that I’m selling a lot of their former customers. Many of these new customers tell me how they told the other dealers why they chose to take their business elsewhere. I believe that before too much longer we will see some changes in the way other car dealers do business even if they refuse to call me, as I have repeatedly invited them to do. Sooner or later they will understand that treating your customers with courtesy and integrity is just plain good business. Estimates on the number of cars on the road right now that need an alignment range from as low as 25% to as high as 75%! 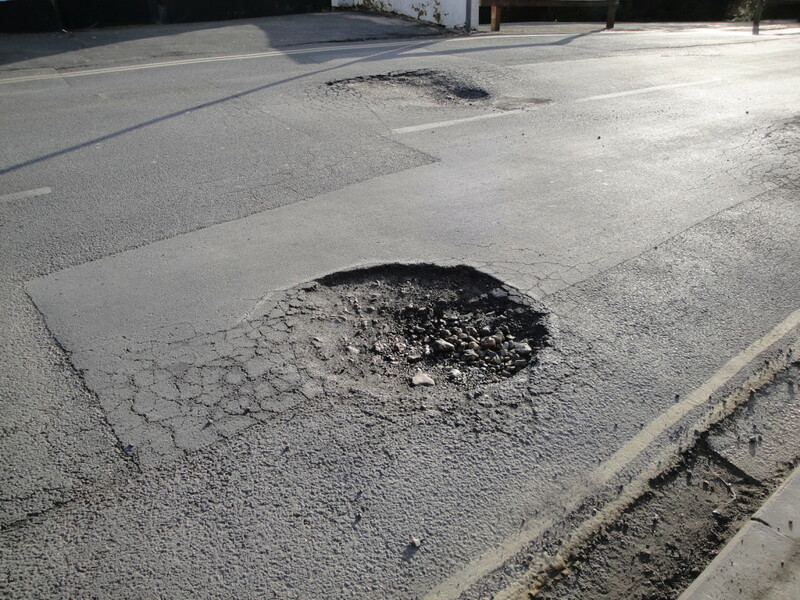 Even if you have the best tires and vehicle that money can buy, all it takes is a little pothole or a curb to cost you a new set of tires. This can cost you anywhere from $300 to over $1,000. If you live in an area with unpaved roads or lots of roads in need of repair and being repaired (Like South Florida) you’re especially vulnerable to potholes and other road obstacles that can knock your front and rear wheels out of alignment. One of my “favorite” ways to misalign my wheels is curbs…I can’t seem to avoid them when I’m parking, especially backing into a parallel parking place. Most people know that if their car is pulling to the left or right, they need an alignment. Most also know that if they see wear on the edges of their tires, they may have an alignment problem (It could also be under inflated tires). But what most people don’t know is that your wheels can be badly out of alignment with no symptoms whatsoever. It’s like high blood pressure and that’s why I used the phrase “silent killer” in the title of this article. Some people can tell their blood pressure is high from headaches or dizziness, but most feel no difference. Most people learn that they have hypertension only when their doctor measures their blood pressure. Unfortunately, many never find out until it’s too late. Last year I had to replace a nearly new set of tires which had only about 5,000 miles on them (it cost me over $1,000) because all four of my wheels were out of alignment. There were no symptoms whatsoever. My car didn’t pull, my steering wheel was perfectly straight, and I saw no abnormal tire wear. I brought my car in for its routine 5,000-mile service and when my technician put it up on the lift to rotate and balance my wheels and tires, he found that the inside of all four of my tires was severely worn. When you have offsetting misalignment on opposing wheels, there is no pull and when the wear is only on the inside of the tire, it’s invisible until the car is up on a lift. I had my car aligned only a few months ago but I knocked it out of alignment again without even realizing it. Aligning the four wheels of your car, like everything else, is a lot more complicated than it used to be. Cars' shocks and suspensions are more complex today. When most cars had rear wheel drive, aligning was simple. Now we have mostly front wheel drive and even some all-wheel drive cars on the road. We no longer do just “front end” alignments we must align all four wheels. In the “old days” service departments routinely checked the alignment for all cars that drove in. There was a simple machine built into the service drive that registered the measurements when you drove over the track. Some service department still use these dinosaurs, but they are not accurate on today’s cars. Nowadays, some older alignment machines are so complex that it takes almost as long to measure your alignment as to adjust it. 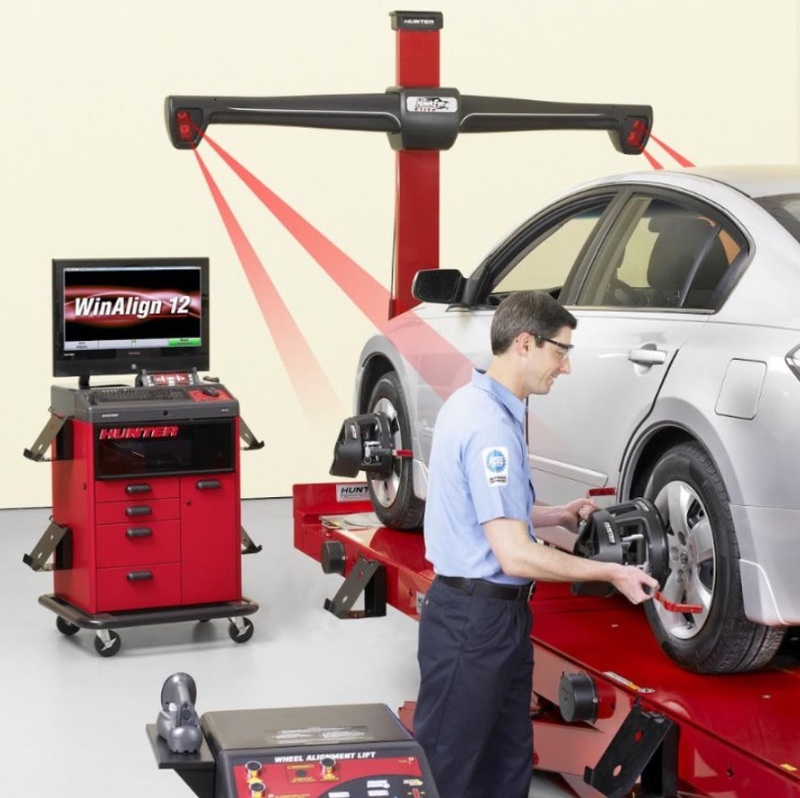 For this reason, many service departments will charge you the same to measure your alignment as they do to align it, even if the measurements find it is perfectly in adjustment. Modern machines will quickly measure alignments, but some service departments don’t have these. When you buy a new or used car, you should insist that the dealer check the alignment. A new car can be knocked out of alignment in many ways. Transporting the car to the dealer from the manufacturer and driving it on or off a ship, truck, or train can do it. A technician can do it during a pre-delivery road test or a car salesman or prospective customer might during a test drive. Remember that a demonstration drive in a new or used car won’t necessarily reveal any symptoms like a pull or abnormal tire wear. Many manufacturers will allow one alignment under warranty for a short time and mileage period (like 1 year or 20,000 miles), but some will only permit the dealer do check your alignment if you complain about a pull or abnormal tire wear. Manufacturers consider alignment a maintenance item that is your responsibility. Therefore it’s important to be sure your new car is aligned when your car is still within the alignment warranty time and mileage.